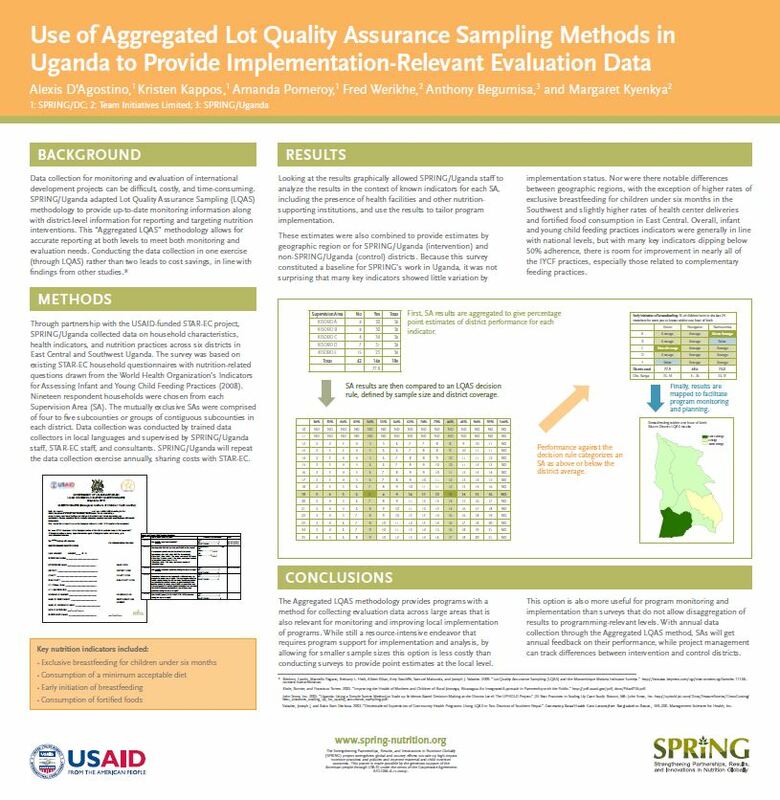 Methods: Through partnership with the USAID-funded STAR-EC project, SPRING/Uganda collected data on household characteristics, health indicators, and nutrition practices across six districts in East Central and Southwest Uganda. The survey was based on existing STAR-EC household questionnaires with nutrition-related questions drawn from the World Health Organization’s Indicators for Assessing Infant and Young Child Feeding Practices (2008). Nineteen respondent households were chosen from each Supervision Area (SA). The mutually exclusive SAs were comprised of four to five subcounties or groups of contiguous subcounties in each district. Data collection was conducted by trained data collectors in local languages and supervised by SPRING/Uganda staff, STAR-EC staff, and consultants. SPRING/Uganda will repeat the data collection exercise annually, sharing costs with STAR-EC. Results: Looking at the results graphically allowed SPRING/Uganda staff to analyze the results in the context of known indicators for each SA, including the presence of health facilities and other nutrition supporting institutions, and use the results to tailor program implementation. These estimates were also combined to provide estimates by geographic region or for SPRING/Uganda (intervention) and non-SPRING/Uganda (control) districts. Because this survey constituted a baseline for SPRING’s work in Uganda, it was not surprising that many key indicators showed little variation by implementation status. Nor were there notable differences between geographic regions, with the exception of higher rates of exclusive breastfeeding for children under six months in the Southwest and slightly higher rates of health center deliveries and fortified food consumption in East Central. Overall, infant and young child feeding practices indicators were generally in line with national levels, but with many key indicators dipping below 50% adherence, there is room for improvement in nearly all of the IYCF practices, especially those related to complementary feeding practices. Conclusions: The Aggregated LQAS methodology provides programs with a method for collecting evaluation data across large areas that is also relevant for monitoring and improving local implementation of programs. While still a resource-intensive endeavor that requires program support for implementation and analysis, by allowing for smaller sample sizes this option is less costly than conducting surveys to provide point estimates at the local level. This option is also more useful for program monitoring and implementation than surveys that do not allow disaggregation of results to programming-relevant levels. With annual data collection through the Aggregated LQAS method, SAs will get annual feedback on their performance, while project management can track differences between intervention and control districts. Kittle, Bonnie, and Francisco Torres. 2005. “Improving the Health of Mothers and Children of Rural Jinotega, Nicaragua: An Integrated Approach in Partnership with the Public.” http://pdf.usaid.gov/pdf_docs/Pdacf756.pdf. Valadez, Joseph J, and Babu Ram Devkota. 2002. “Decentralized Supervision of Community Health Programs: Using LQAS in Two Districts of Southern Nepal.” Community-Based Health Care: Lessons from Bangladesh to Boston., 169–200. Management Sciences for Health, Inc.